PRI, also referred to as RTS, is a 316-acre piece of scenic open space with many uses located close to Kimball Junction. Locally famous for its off-leash dog area, Run-A-Muk, its gentle RTS Trail single track loop and its challenging 5K groomed ski only track, this area is a year-round hot spot in Snyderville Basin. The property is home to a beautiful mix of wetlands, wet meadow, upland scrub, aspen, mountain mahogany and conifer forests. Run-A-Muk is year-round off-leash dog heaven with 43 acres of open space and 2 miles of hiking only trails. Across the street from Run-A-Muk is the RTS Trailhead from which users can access trails in the Utah Olympic Park and beyond. In the winter, enjoy the Basin 5K loop for a challenging skate or classic ski. Note that no dogs are permitted on the Basin 5K loop. RTS/Basin 5K and Run-A-Muk can be found on the upper Olympic Parkway and the Overland Trailhead (behind the outlet malls) provides access to lower PRI. When the Run-A-Muk Trailhead is full, avoid parking on the street and access the off-leash area via the RTS pedestrian underpass tunnel. Run-A-Muk: It’s a dog and human paradise with 2.6 miles of trail. This is a hiking only area. Please stay on the trail and pick up after your pet. RTS: RTS is a beginner to moderate multi-use trail consisting of a 2.5-mile loop. The loop wanders through aspen highlands and wet meadow/grass areas and can connect to the UOP system and beyond to make for a longer adventure. 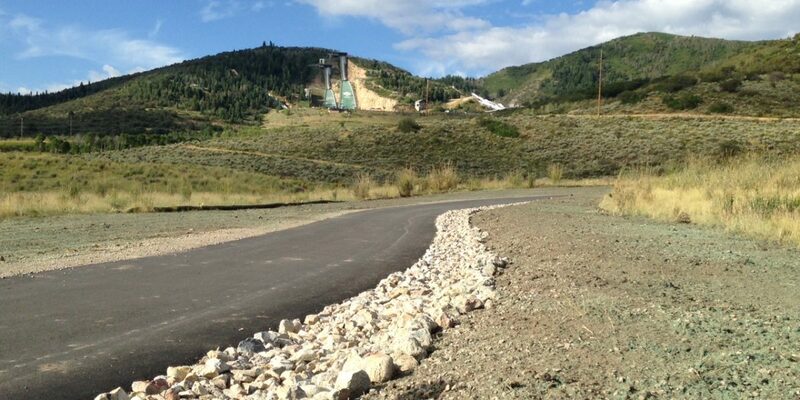 Millennium Trail: This paved multi-use transportation trail connects Summit Park to Park City. A short stretch of this trail travels through the PRI property and can be used year-round. Park at the Overland Trailhead for best access.